Let's play tag! And I'll be it. 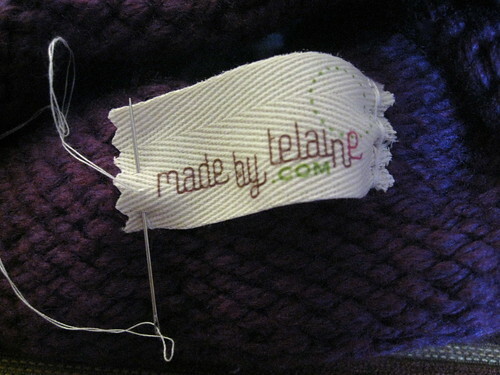 I got some nifty labels to stitch into the latest Made by Telaine products. 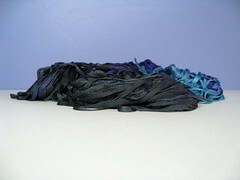 Etsy shop Mommie Made It printed my logo on organic cotton twill ribbon and shipped them to me last week. 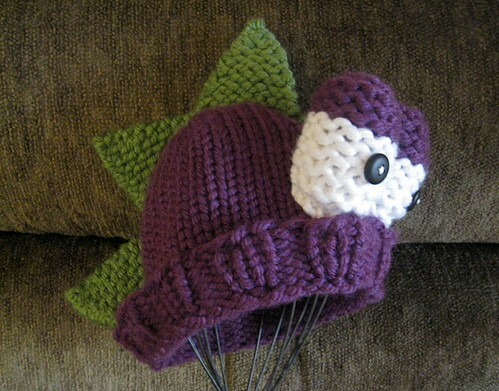 That was just in time for the first label to go on a purple dino hat. This beastie got shipped to a Sputnikfest customer this morning. I know I keep saying dinos are coming to the Etsy shop but they are selling as fast as I can make them. 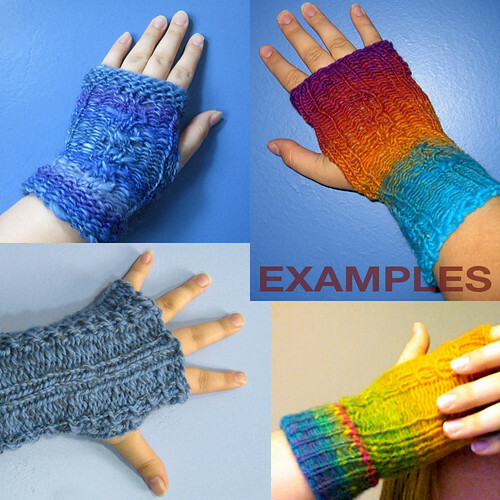 If you really want one for Christmas, I recommend placing a custom order! 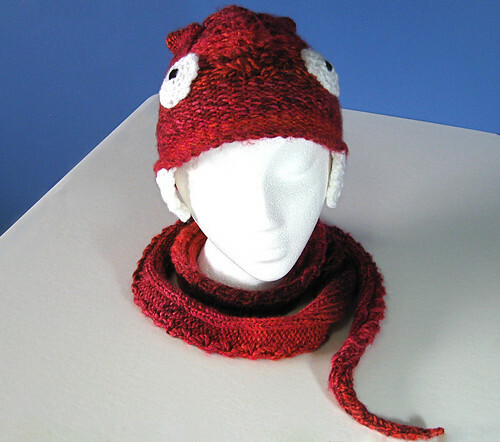 Red dino hat / requested by a long-time friend for her dino-loving kid / due in October ... A purple youth dino hat *should* be coming into the shop around then, too. Pink and white afghan / requested by a sweet local friend / half done and due in November … it's got the farthest-out deadline but it's the biggest project. 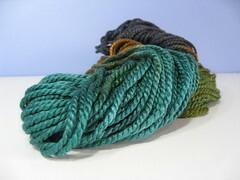 So that's what I'll be knitting up tonight with a little Farscape on the TV. Happy looming! My newest job has me wrapped around its little finger. 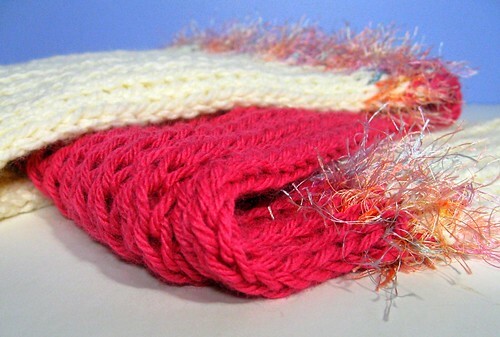 With yarn. And I don't mind a bit! 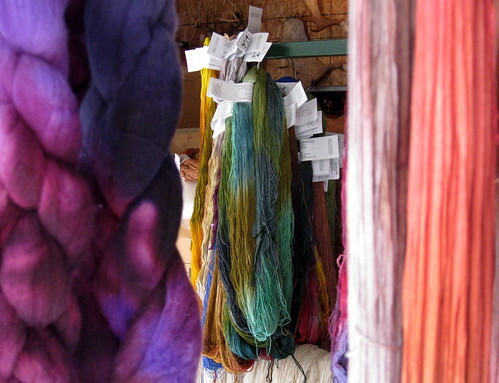 Let me introduce you to Interlacements Yarns and the woman who has a heart as big as her craft stash. 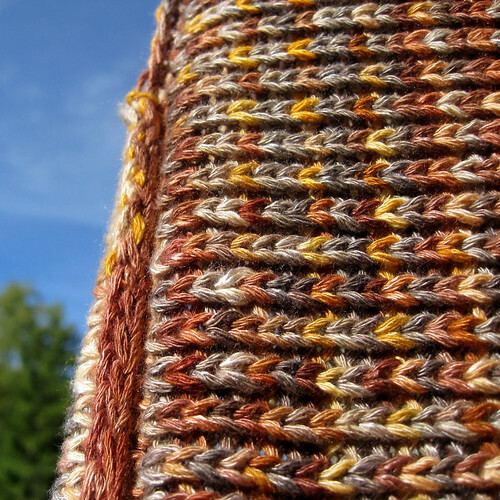 Do you remember the bit of happy news from Stitches Midwest I couldn't quite share yet? 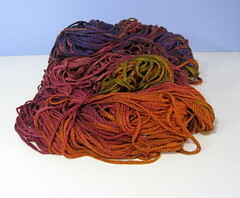 Well, the yarn's out of the bag as of right now. 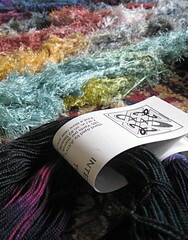 With my knitty friends Zoe and Em, I became reacquainted with an old Loops and Links regular Tracey Schuh. 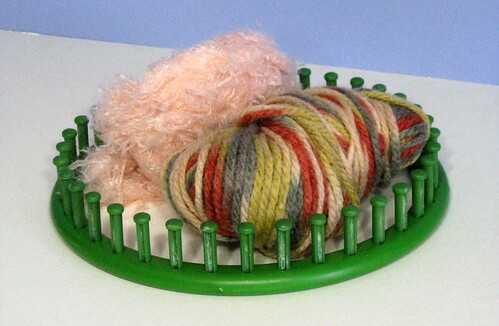 I remembered her as the amazing sock-machine knitting magician (which is another hobby I'd like to try someday). And I've since learned she once had an interest in loom-knitting, too. 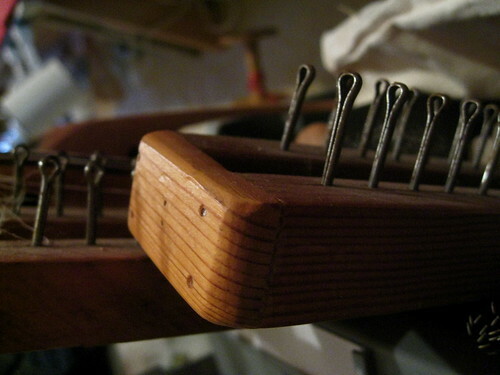 Two pretty antique knitting boards came home with me. 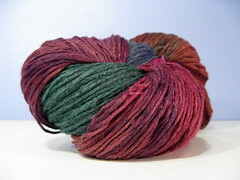 She and her husband had just bought Interlacements Yarns and were running the booth at the yarn expo. Before us gals knew it, she asked us to work for her at Stitches West in Santa Clara, Calif., in February. !!! Yep, California, here we come. OK, this isn't California. 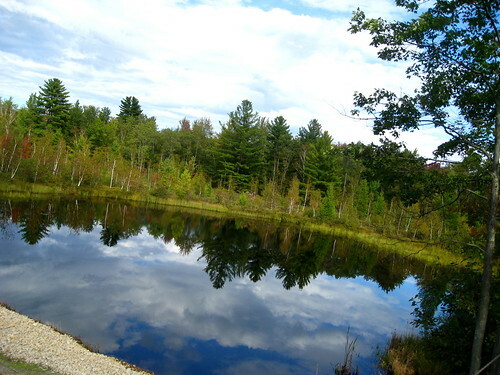 But Tracey does have a breath-taking backyard that makes you feel like you're on vacation. 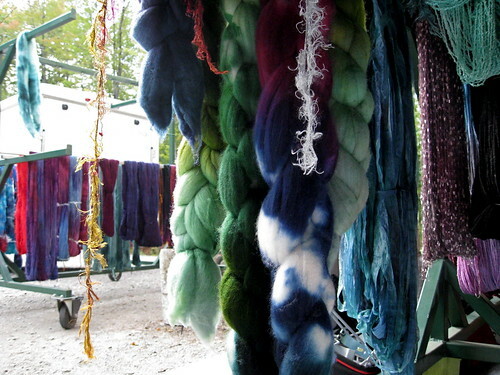 But before we sell the yarn, we got to learn the yarn. 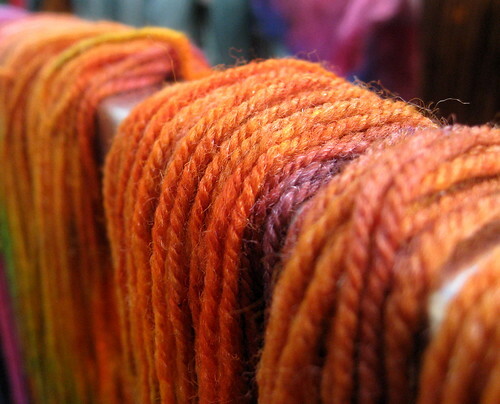 So we've paid some visits to her home and headquarters … and in turn, have been paid in yummy yarn and other goodies. Another "payment" ... 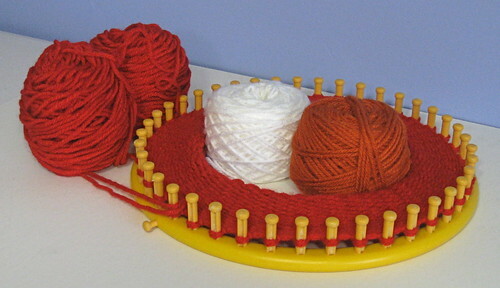 This 60-inch Decor Accents knitting board means I will never have to knit lap afghans in panels again! 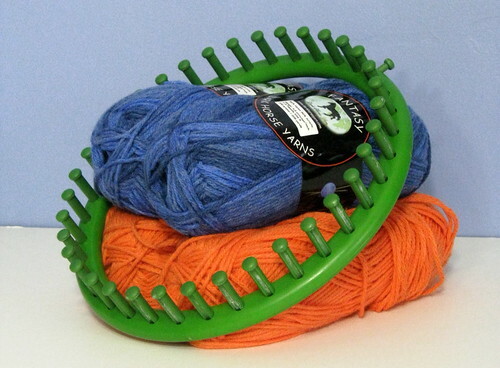 But this goes beyond yarn play for me. I also get to employ my graphic design skills. 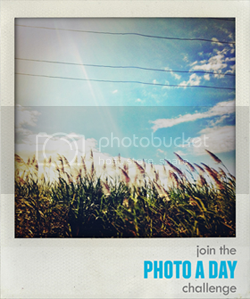 My work has spanned from logos and photography to creating an Etsy shop. 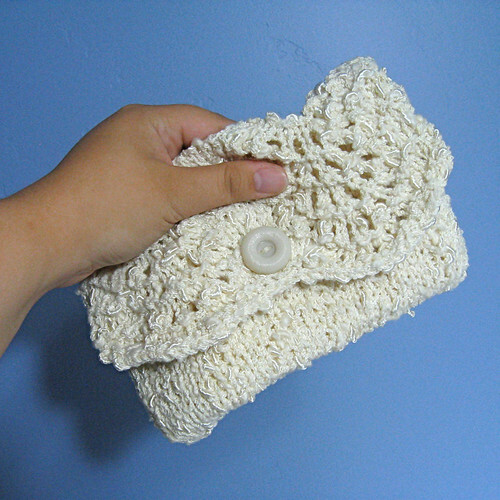 During our last visit, I took photos of her samples to sell. … And more beauties are on their way! The forecast wasn't promising. But we made the trek to my hometown of Manitowoc, Wis., on a very rainy morning with hope in my heart. 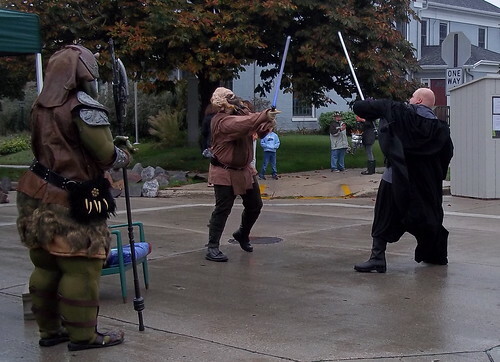 And it turns out a cloudy day doesn't scare away the alien enthusiasts. 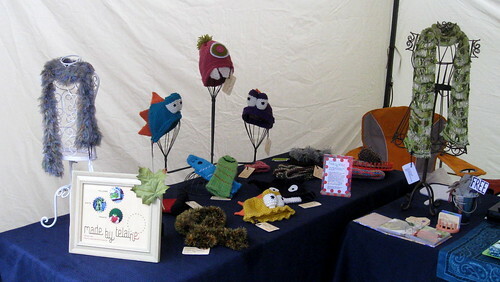 My little Made by Telaine venture made a splash at this year's Sputnikfest. Mr. Plat and I got soaked until the tent was actually up. Have I mentioned how awesome my husband is? 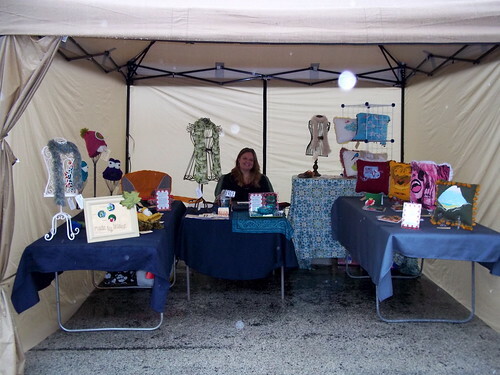 He got up at 5:30 a.m. to help drive 45 minutes to set up a craft fair booth in the rain. More thanks to ... My dad who found and delivered tables; my mom who sat with me for most of the day; AND my sisters and knitty friends who drove from out of town and stopped by, umbrellas in hand. We had no idea anyone was even going to show up to this shindig. Anyway ... A few drip drops creeped in so I strategically arranged the products in the drier areas — and rearranged about three times until the fair began. The dino hats and glow-in-the-dark wristbands were the big winners in the booth. 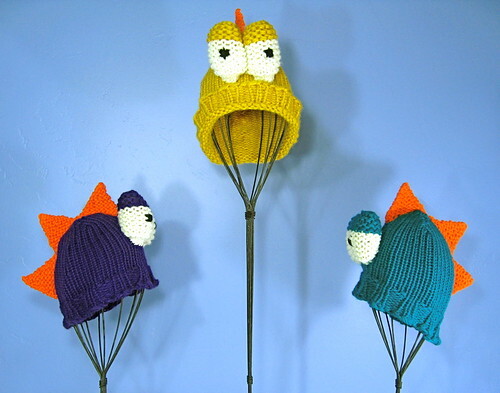 And now I have two, maybe four, more dino hats to make this fall! If you want one for Christmas, we better chat soon! 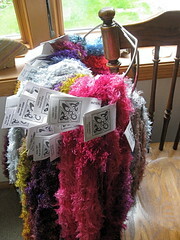 The displays I bought from Shana (Loops & Links yarn shop) came in handy. 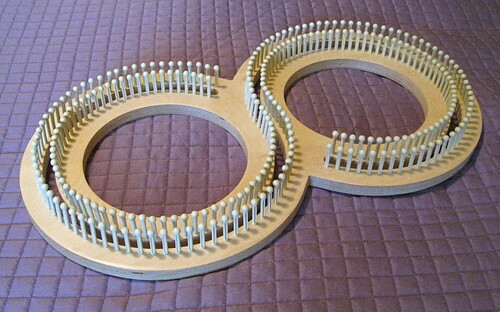 My little signs about loom-knitting and pillow-making were read by a few. I think I need a bigger sign though. I had made enough sales to pay for my booth fee and then some when a sweet surprise came my way. I won second place for Best of Show!! The "pottery guy" won first and I believe it with everything I heard about his awesome egg cookers. I also met the wonderful gal behind Gracie Designs who is working on creating a crafter co-op in my area. 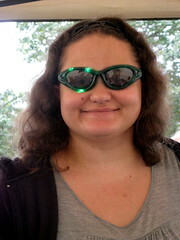 The fair organizer, Kim, was also a sweet, laidback gal to work with. 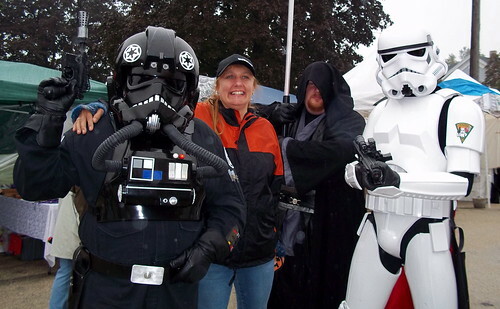 My mom hangs out with some Star Wars characters. 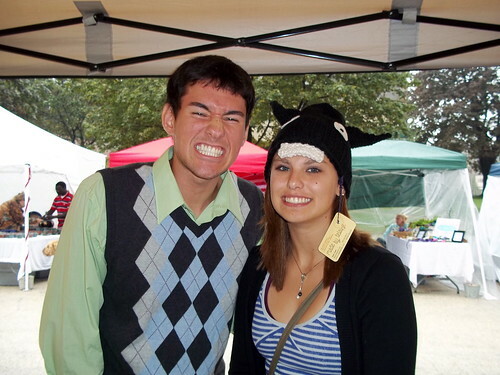 My sister, Tessa, tries on a monster hat but I think her boyfriend, Brian, makes a more convincing monster face. 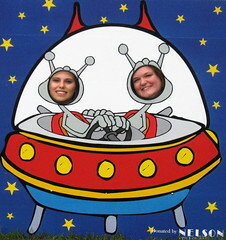 Tracy goes alien with some new specs ... Tessa and I drive a spaceship for a few minutes. 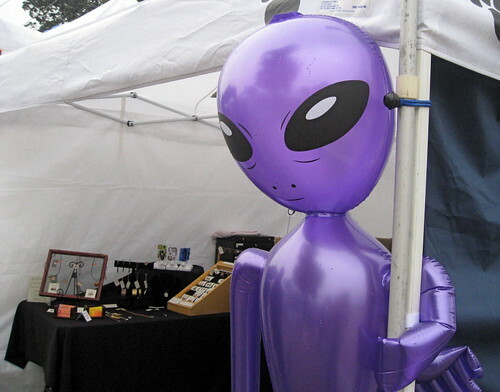 A purple alien welcomes folks to the craft fair. 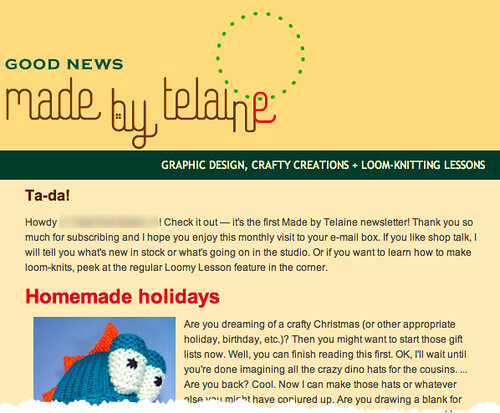 Lots of Made by Telaine pins went to the kids who like free stuff — or maybe I inspired some future knitters. Ok, ok ... I know the real reason. 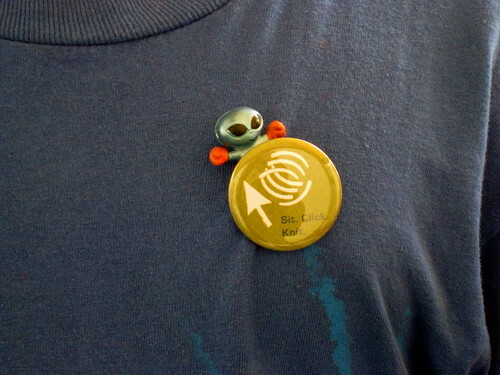 This alien dude found a good home at least! I had a blast at Sputnikfest and I would do it again ... with hopefully a sunnier day. I'm going to get one of those blow-up aliens, too. 3 ... 2 ... 1 ... BLAST OFF! 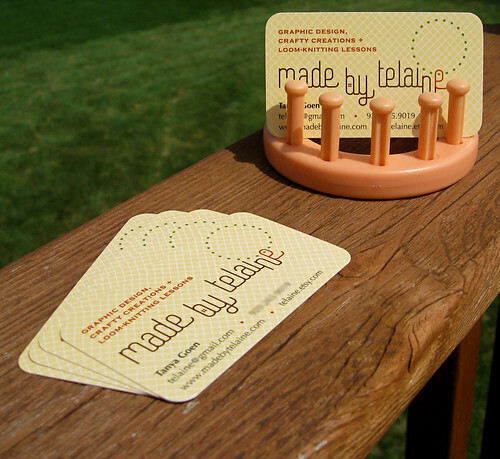 The latest Made by Telaine merchandise is rocketing to this weekend's craft show at Sputnikfest. After several weeks of knitting, stitching and punching — let's check out the out-of-this-world artifacts! 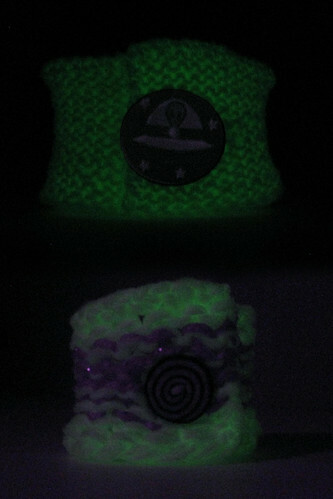 Wacky wristbands and hairbands made with glow-in-the-dark yarn are a Sputnikfest special. 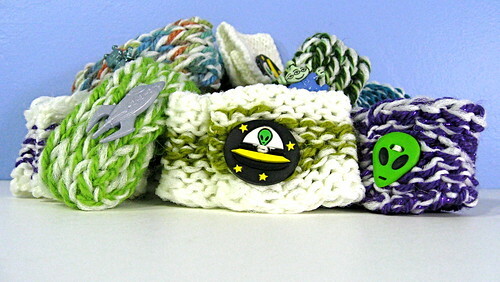 My mother-in-law Diana helped find some awesome alien buttons to embellish these stretchy loom-knits. Check out the glow! They can be a fun festival souvenir now and Halloween accessory later. And speaking of the costumed holiday, the dino hats are finally back! The purple and jade are baby-size, which makes them a quick costume for your little one. The yellow dino is just a little bigger for a toddler. They are fun to wear even after Halloween. I'm accepting custom orders for any size. What would a good launch be without a soft-landing? 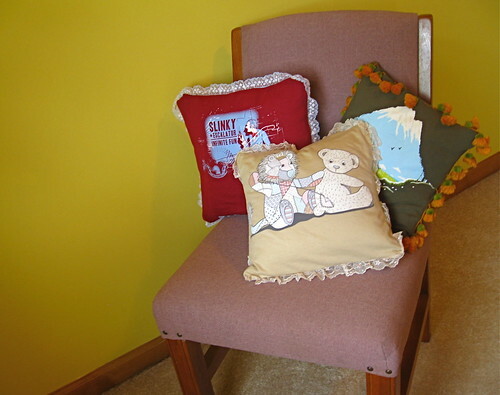 I cut up some no-longer-loved shirts to make t-pillows. They all come with a removable plush pillow for easy cleaning. Do you have a favorite tee that is no longer wearable? Bring it to the booth or talk to me on Etsy — I can give it a second life! My business cards boast a second use, too. 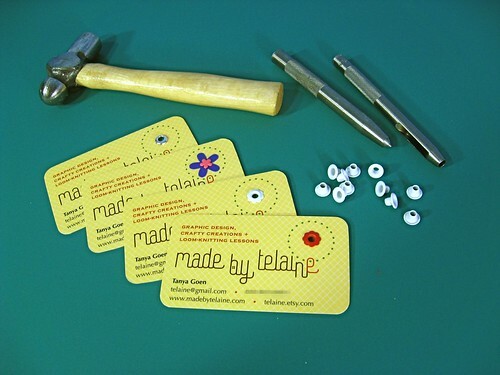 With my friend Erin's help, I punched some holes and hammered some eyelets into these very resilient cards. I really had to hammer hard (or ask my husband) to get these holes made! But now they double as product tags with price info on the back. I'm very happy with how they turned out! 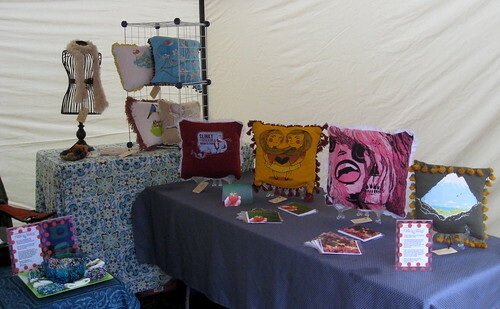 The Artta this World craft fair is at Sputnikfest from 10 a.m. to 4 p.m. at the Rahr-West Art Museum in Manitowoc, Wis. I'll be setting up shop in Booth 7. If you're not local, don't fret. Items much like these will be heading to the online shop, too!